Doctor’s CarbRite Sugar Free Low Carb Chocolate Bars are now available in milk chocolate, dark chocolate, dark chocolate with almonds, white chocolate, and mint chocolate. These full size chocolate bars are sugar free and have zero net carbs. Take a look at our wide selection of low carb chocolate, only at Linda’s Diet Delites! 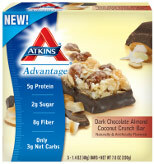 The new low carb Atkins Advantage Dark Chocolate Almond Coconut Crunch Bar is now available. Check out all of our Atkins bars and low carb bars at Linda’s Diet Delites! 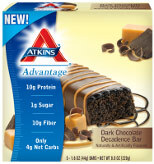 The new low carb Atkins Advantage Dark Chocolate Decadence Bar is now available. Maine Cottage Foods Low Carb Chocolate Bark Back in Stock! Maine Cottage Foods Low Carb Chocolate Bark is now back in stock in both milk chocolate coffee bean and dark chocolate coffee bean flavor. Checkout our wide selection of low carb chocolate at Linda’s Diet Delites! Posted on June 26, 2010 March 7, 2011 Categories UpdatesTags low carb chocolate, Maine Cottage Foods Low Carb Chocolate Bark Back in Stock! CarbRite Diet Low Carb Bars are now available in even more flavors. We’ve added cookie dough, toasted coconut, frosted cinnamon bun, lemon meringue, raspberry chocolate truffle, banana nut, and s’mores. Checkout our wide selection of low carb bars at Linda’s Diet Delites! Mediterranean Snack Food Company Lentil Chips now available in Cucumber Dill, Sea Salt, or Sea Salt & Cracked Pepper. Be sure to check out our wide range of low carb snacks and gluten free snacks at Linda’s Diet Delites! Udi’s Gluten Free Pizza Crust now available. Udi’s Gluten Free Cinnamon Rolls now available! Check out our great selection of gluten free pastries at Linda’s Diet Delites! 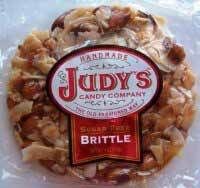 The Judy’s Candy Brittle flavors have been expanded from only Coconut Almond Brittle to also include Mixed Nut Brittle, Popcorn Nut Brittle, and Coconut Peanut Brittle. All are sugar free and low carb. Check out our wide selection of low carb candy at Linda’s Diet Delites! Mrs Crimble’s Gluten Free Cheese Crackers now available in Original Cheese or Rosemary & Onion flavor.